Step 1. Access the Brands page. 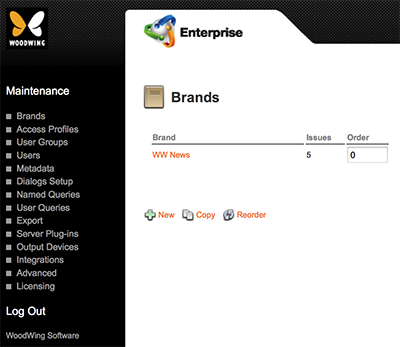 A default Brand named 'WW News', already exists. Step 3. Fill out the details. Note: At the most basic level, only a name needs to be entered; all other options can also be set at a later stage by modifying the created Brand. Name. Name of the Brand. E-mail Notifications. 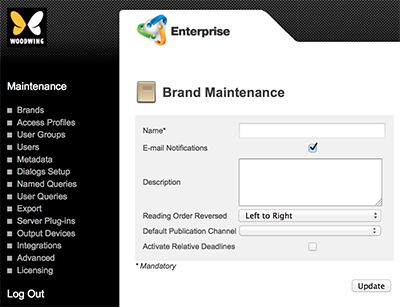 Determines whether e-mail notifications should be enabled for this Brand when files are routed to a user or user group. Description. Description of the Brand. Reading Order Reversed. Determines whether the pages in the Issue are displayed left-to-right or right-to-left (reversed) when viewed in the Publication Overview of Content Station. Auto Purge. (Only available when the Enterprise Server Job named AutoPurgeTrashCan is made active.) Defines the time period (in days) after which objects are permanently removed from the Trash Can. Enter 0 (zero) to disable the Auto Purge feature for the Brand. Default Publication Channel. Defines the Default Publication Channel. Setting this option will be possible when Publication Channels have been set up. This will be covered in a later step. Activate Relative Deadlines. Activates the functionality for assigning deadlines to Categories and Workflow Statuses. When selected, the 'Time Settings' icon appears. Time Settings. (This option only appears when 'Activate Relative Deadlines' is selected.) Opens the Relative Deadlines page. Setting this option will be covered in a later step; leave it as it is for now.